Local governments in Minnesota have been at the forefront of expanding fast, affordable, and reliable Internet access - often in some of the most challenging areas of the state. 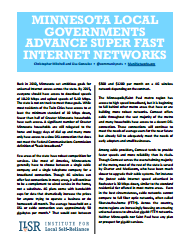 ILSR has just released a policy brief to explore some of these approaches: Minnesota Local Governments Advance Super Fast Internet Networks. The brief examines five communities that have taken different approaches to expanding access, from working with a trusted local partner to creating a new cooperative to building community-wide FTTH networks. Lac qui Parle County has worked with Farmers Mutual Telephone cooperative to bring fiber networks to those who had been stuck on dial-up. Finding itself in a similar situation with no reliable partner, Sibley County is creating a new coop to work with. Scott County built a fiber ring to connect community anchor institutsion to dramatically expand access to high capacity networks and lower telecommunications budgets. That network has helped to lure several major employers to the area by leasing fiber to them. Windom and Monticello have built FTTH networks in extremely challenging conditions. Though Windom is far smaller than most have believed is feasible to build such a network, it has thrived and is now connecting many of the small towns surrounding it. It was essential in retaining jobs in the community that would have been lost without it and has attracted new jobs to the region. Monticello is a younger network and has remarkably benefited the community even as it has struggled financially due to dirty tricks from the telephone and cable companies. The policy brief makes some policy recommendations while focusing on some local solutions to difficult problems in ensuring all Minnesotans have fast, affordable, and reliable Internet access.